Registration for the spring term is now open. Students who have unpaid fall charges or are not up-to-date on their payment plans will be unable to register. All spring tuition and fee charges are due by January 9, 2017; any remaining balance after that date is subject to finance charges. Spring 2017 billing statements will be electronically sent to all registered students on December 8. Students will have reminders sent to their Augsburg email account during the first week of each month reminding them to view their online monthly bill. All students are encouraged to give parents/guardians access to view these statements. All students are eligible to enroll in Augsburg’s Online Payment Plan; enrollment opens December 8. Go to augsburg.edu/studentfinancial/payment-plans-and-discounts/ to sign up for the payment plan. To ensure five monthly payments, the application must be completed by December 26. Students can make payments online by going to augsburg.edu/studentfinancial/payments/. Please see the Parent Information tab at augsburg.edu/studentfinancial/ for instructions on making a payment, signing up for a payment plan, and obtaining access to discuss your student’s financial information. Please note that we will be unable to speak with any parent/guardian that has not been authorized by the student. Registration for the spring term begins November 7, 2016. Students who have unpaid fall charges, or are not up-to-date on their payment plans, will be unable to register. Students can make payments online by going to http://www.augsburg.edu/studentfinancial/payments/. Please see the Parent Information tab at augsburg.edu/studentfinancial/ for instructions on making a payment, signing up for a payment plan, obtaining access to discuss your student’s financial information, etc. Please note that we will be unable to speak with any parent/guardian that has not been authorized by the student. The Fall 2016 billing statements were electronically sent to all registered students on July 7; the due date was August 1. Students will have reminders sent to their Augsburg email account during the first week of each month reminding them to view their online monthly bill; all students are encouraged to give parents/guardians access to view these statements and to complete the online Information Release form. Please note that we will be unable to speak with any parent/guardian that has not been authorized by the student. Please see the Parent Information tab at augsburg.edu/studentfinancial/ for instructions on obtaining access, making a payment, signing up for a payment plan, etc. The last day to register for 4 monthly payments under Augsburg’s Online Payment Plan is August 26. To ensure 4 monthly payments, the application must be completed by August 26. Please see the Parent Information tab at augsburg.edu/studentfinancial/ for instructions on signing up for a payment plan. 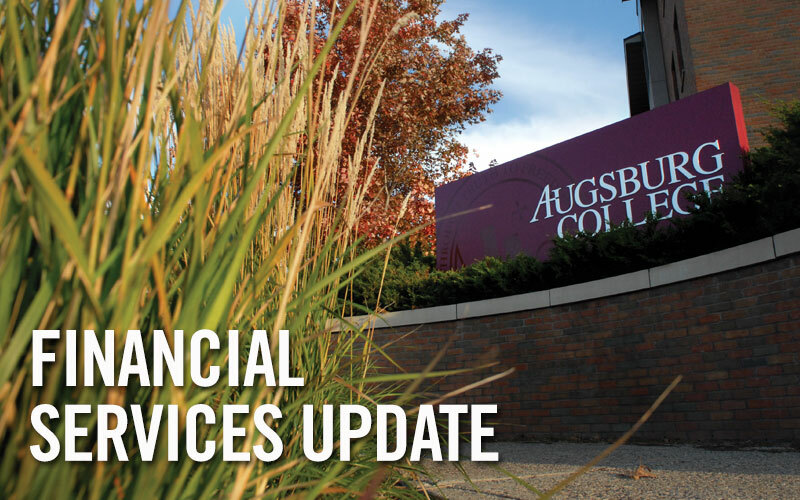 All students can schedule an appointment with a Student Financial Services staff member, review their student account, and track their financial aid status by going to augsburg.edu/studentfinancial/ . The 2016-2017 FAFSA (Free Application for Federal Student Aid) can be completed online at FAFSA.ed.gov two to three weeks after filing the student’s and parent(s) 2015 federal taxes. Remember to use the IRS Data Retrieval Tool to directly import the tax information, and make sure to submit the FAFSA by signing with your FSA ID. The priority deadline for completing the financial aid application is May 1. Registration for the summer/fall 2016 terms begins April 4. Students who have unpaid spring charges, or are not up-to-date on their payment plans, will be unable to register. Tuition accounts must be paid-in-full for a diploma and/or transcript to be released; please see the Parent Information tab at augsburg.edu/studentfinancial for instructions on making a payment. The spring 2016 billing statements were electronically sent to all registered students on December 10 with a due date of January 5, 2016; any remaining balance after that date is subject to finance charges. Students will have reminders sent to their Augsburg email account during the first week of each month reminding them to view their online monthly bill. All students are encouraged to give parents/guardians access to view these statements. Students must log in towww.augsburg.edu/studentfinancial/ and select ‘Make a Payment/Account Activity’ on the right hand menu. Click ‘View your online student account’ and follow the instructions under ‘Parent/Third Party Access Instructions – Make a Payment’. Students can view their statements by logging into Inside Augsburg and selecting Records & Registration. Click on Make a Payment/Account Activity/Statement History and then view or download Augsburg Bill. To view a student’s transaction history, follow all previous steps except select Click here to view transaction history; this is a more comprehensive and detailed view of a student’s account. Students are also encouraged to give parents/guardians access to view their billing statements. Students must log in to Student Financial Services and select Make a Payment/Account Activity on the right hand menu. Click ‘View your online student account’ and follow the instructions under Parent/Third Party Access Instructions – Make a Payment. All students are still eligible to enroll in Augsburg’s Online Payment Plan; however, the payments will be divided into four monthly payments if the application was not completed by December 26. Students must log in to Student Financial Services and select Make a Payment/Account Activity on the right hand menu. Click Payment Plans and Discounts and follow the instructions under Augsburg Online Payment Plan. To ensure 4 monthly payments, the application must be completed by January 26, 2016. To comply with FERPA regulations, students must complete the online ‘Information Release’ form in order for our office to communicate with anyone besides themselves. The student must log into their Augnet account or Inside Augsburg and click on Records and Registration. Under Information Release they need to Add an Authorization. They will enter the full name and email address of the party/parties being granted permission for communication. Next, select Financial Aid/Finances Release and then click Save. Please note that we will be unable to speak with any parent/guardian that has not been authorized by the student. Registration for the spring term is now open. Students who have unpaid fall charges, or are not up-to-date on their payment plans, will be unable to register. All students are eligible to enroll in Augsburg’s Online Payment Plan; enrollment will open on December 8. Students must log in to www.augsburg.edu/studentfinancial/ and select ‘Make a Payment/Account Activity’ on the right hand menu. Click ‘Payment Plans and Discounts’ and follow the instructions under ‘Augsburg Online Payment Plan’. To ensure 5 monthly payments, the application must be completed by December 26. All spring tuition and fee charges are due by January 5, 2016; any remaining balance after that date is subject to finance charges. The spring 2016 billing statements will be electronically sent to all registered students on December 8. Students will have reminders sent to their Augsburg email account during the first week of each month reminding them to view their online monthly bill. All students are encouraged to give parents/guardians access to view these statements. Students must log in to www.augsburg.edu/studentfinancial/ and select ‘Make a Payment/Account Activity’ on the right hand menu. Click ‘View your online student account’ and follow the instructions under ‘Parent/Third Party Access Instructions – Make a Payment’. Please be advised that our office is unable to communicate with anyone besides the student on financial issues unless they have completed the online ‘Information Release’ form. The student must log into their Augnet Account at augnet.augsburg.edu or inside.augsburg.edu and click on ‘Records and Registration’. Under ‘Information Release’ they need to ‘Add an Authorization’. They will enter the full name and email address of the party/parties they are giving permission for us to communicate with. Next, select ‘Financial Aid/Finances Release’ and then click ‘Save’. Registration for the spring term begins November 9. Students who have unpaid fall charges, or are not up-to-date on their payment plans, will be unable to register. Students can make payments online by logging into augsburg.edu/studentfinancial and going to Make a Payment/Account Activity on the right-hand menu. Click on Make a Payment and then Make a Payment Online. Students are highly encouraged to give parents/guardians access to view their financial statements. Students must log in to augsburg.edu/studentfinancial and select Make a Payment/Account Activity on the right-hand menu. Click View your online student account and follow the instructions under Parent/Third Party Access Instructions – Make a Payment. Please be advised that our office is unable to communicate with anyone other than the student on financial issues unless they have completed the online Information Release form. The student must log into their Augnet Account at augnet.augsburg.edu or inside.augsburg.edu and click on Records and Registration. Under Information Release they need to Add an Authorization. Enter the full name and email address of the party/parties to whom they are giving permission for our communication. Next, select Financial Aid/Finances Release and then click Save.